Murder and intrigue cling to Maxime Martin as stubbornly as the scent of French perfume. 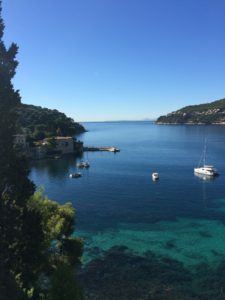 In his first adventure, A SCANDAL IN NICE, Maxime uses his natural charisma and keen observational skills to teach French at an elite language school on the Cote d’Azur. By night, he uses these skills for quite a different purpose: coaxing information from witnesses to solve the mysteries that fall at his feet. In truth, he’d much rather be home knitting. One day while guiding a school excursion to a medieval hilltop village, he glimpses the love interest who slipped through his fingers and whose memory still haunts him. Eager to reunite with the woman he refers to simply as The One, he pursues her through the village until she leaps to her death. He’s frantic with grief until he discovers that the woman is a stranger disguised to look like The One. Curiously, a stolen Matisse drawing is stuffed up her sleeve. The next day, a distraught colleague thrusts an anonymous death threat under his nose and begs him to help identify the sender. Convinced the letter is tied to the dead woman—and to the long-deceased Henri Matisse—Maxime races against time to avert more art thefts, death threats, and apparent suicides. A SCANDAL IN NICE traces Maxime’s journey along the French Riviera and into the private life of Matisse to untangle the mystery. It’s as much a delightfully old-fashioned whodunit featuring an unconventional hero as it is a love affair with France. It’s also the first in a series of THE KNITTING DETECTIVE mysteries, each unfolding in a different French city and steeped in local culture and history, and each showing the resourcefulness of this seductive Frenchman whose knitting helps him catch a killer.